From the depths of almost crashing out of the Football League, Brighton & Hove Albion have soared to the heights of the Premier League and lifelong fan Tony Bloom never saw his investment as a gamble. Since taking over as chairman eight years ago, the Seagulls have steadily been building the right way and a return to football’s top flight - after 34 years away - is the owner’s royal flush. Bloom - who made his money in poker, before moving into the property and sports betting world - has ploughed an estimated £250million to drive the Seagulls to the promised land. That has come with the brand-new state-of-the-art Amex Stadium and the new luxury training centre at Lancing, along with the transfer kitty. Wild scenes erupted at Falmer on Monday as goals from Glenn Murray and Sussex lad Solly March capped a 2-1 win over Wigan to all but seal promotion. They had to wait for Huddersfield’s 1-1 draw with Derby for the mathematics to confirm it, but the celebrations were well underway already. Fans invaded the pitch, the players and chairman invaded the press box, belting out songs and chants to the capacity crowd, before Chris Hughton’s players took the train to the city centre and continued to celebrate with supporters long into the night. But 20 years ago, it was almost a stark contrast on the south coast. Brighton were on the brink of dropping into the Conference until a final-day draw with Hereford kept them up. The owners had sold the Goldstone Ground, leaving them homeless and exiled at Gillingham, until a switch back to the modest Withdean - little more than an athletics stadium. Two years into his reign, Bloom took Brighton into the shiny new Amex and they have not looked back since, despite missing out in the play-offs in three of the past four seasons. Bloom revealed: “Myself and 30,000 people here - although maybe some weren’t alive at the time - and many, many thousands of others in the city and Brighton supporters living across the world will now feel elated that we are in the Premier League. “We were this close to going out of the Football League, who knows what the future would have held if we were in the Conference without a stadium, so this is a truly amazing feeling both as a fan, the chairman and the owner. “Days like this are never inevitable, you can get close six or seven times on the spin. I remember about 15 years ago Preston got in the play-offs three times and they never made it. It gets tougher every year and new owners are always coming in and spending a lot of money. “Everyone at the club has been working very hard to get to this position. It is so well deserved by so many at this club and they absolutely deserve it. “Last season we finished with 89 points which almost any other season gets you automatic promotion, but it didn’t happen for us. Things didn’t go right at the end of the season and we have been on the go ready for this moment from the first day of the season. Albion will pocket an estimated £200million payday for their promotion, but Bloom, while agreeing to spend, has vowed not to break the bank. 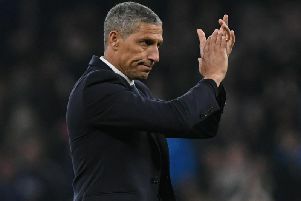 He instead will continue to let Hughton, who has gone about his business this season as professionally as ever, to grow his team the right way. Albion need just one more win to pip favourites Newcastle United to the Championship title, something they can achieve at Hughton’s former side Norwich on Friday evening. But Bloom’s eyes are already fixed on next season. On what Brighton will bring to the top table of English football, he said: “I think we will bring a great city, great fan base, amazing stadium that will be sold out I imagine every single game and hopefully on the pitch, we will do the city and our supporters proud. “The amounts of money in the Premier League does equalise things a little bit. Money is spent every season by pretty much every single club.